There's no denying that Jonathan Butler has been blessed with a fascinating life. A South African native whose expansive musical gift has earned accolades across an international career, Butler's new, self-produced Gospel release, Grace and Mercy, is filled with the soulful sounds and insightful lyrics fans have come to expect from the veteran performer. 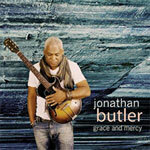 On Grace and Mercy, Butler delivers a collection of songs that serve as a soothing musical balm. The single "Don't Walk Away" was serviced to smooth jazz radio in early August.